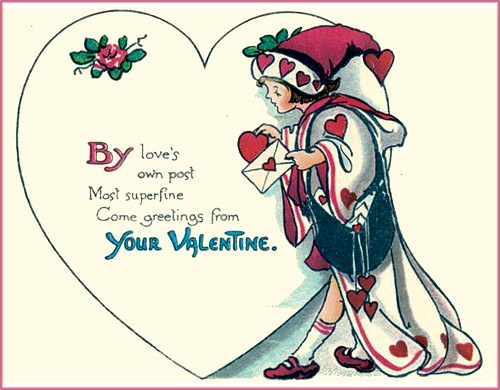 • Free Valentines Day cards galore for you to see, enjoy and explore. 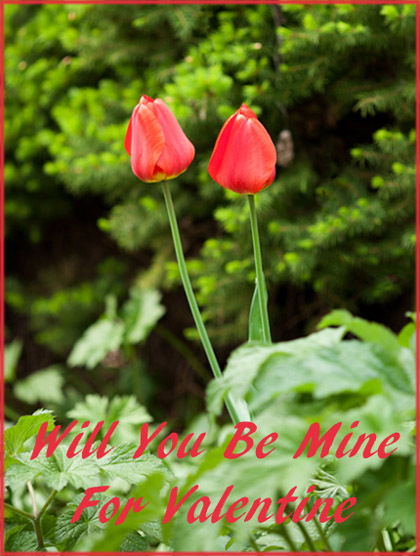 • Sweet Valentines Poems to inspire, to set your love bird's heart afire. 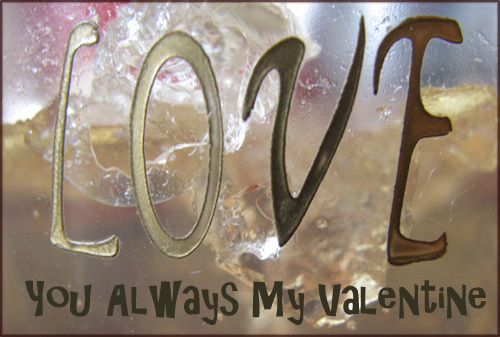 • A true Valentines greeting cards coup with kind regards from Quotescoop.com to you. 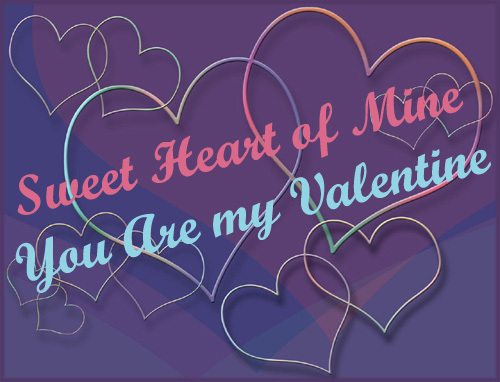 Ring in this special day with a cute free Valentine card to your special someone. 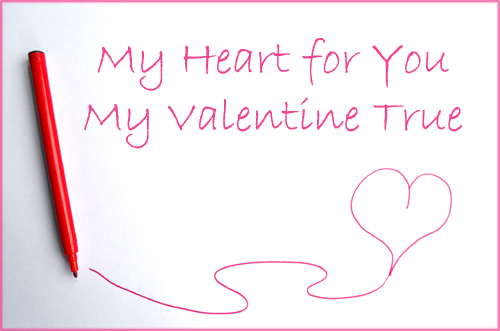 On this page you'll find lots of different kinds of Valentines cards so it should be quite possible for you to find at least one, perhaps two, perhaps three or perhaps even more great cards that fit your taste. What Exactly Is It, We're Celebrating on Valentine's Day? If you're interested, we'd like to invite you on a journey to discover the original meaning behind the tradition of Valentine's Day, also known as St. Valentine's Day. (If you're just here to find free Valentine cards, by all means skip this bit and scroll down to find the cards). Valentine's Day is old. Very old. You see, the official St. Valentine's Day was set by Pope Gelasius all the way back in 496 AD. 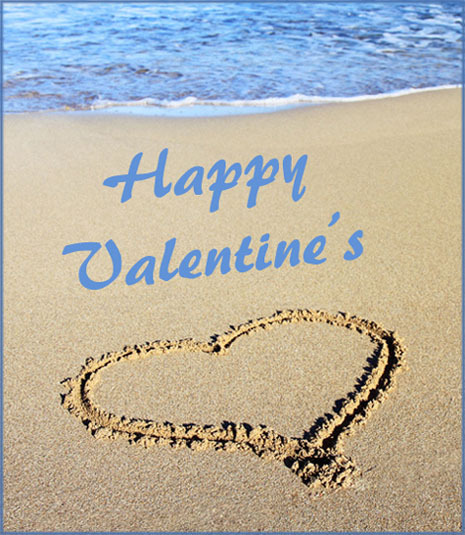 Even though Valentine's Day today is celebrated in the joyful spirit of love and affection the ancient history of that day is of quite a different nature. You see, what we're officially celebrating on St. Valentine's Day is St. Valentine's day of death. Not an ordinary death, but martyrdom. Not One, not Two but Three St. Valentines! Apparently, there is a very high frequency of heroic Valentines to have been executed in the past after which they attained sainthood because of their noble death sacrifice. 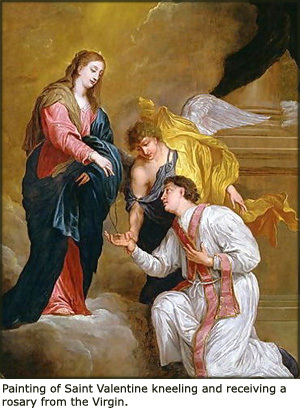 According to legends, Valentine was an unfortunate priest in Rome who ended up being executed by Roman Emperor Claudius II in 269 AD (more on this story in a bit). Roman emperors seem to have a lot to answer for. This Valentine (a bishop in Terni, approximately 197 AD) was also to have been killed as a result of an Emperor's (Emperor Aurelian) actions or persecutions. Almost nothing is known about this Valentine other being martyred in Africa. What Has Valentine of Rome Got to Do with Unending Love, Lush Flowers and Sweet Chocolate? Well, probably not much! Sorry! There are many myths and unanswered questions when it comes to unravelling the connection between the celebration of love on Valentine's Day and the sacrifice of St. Valentine. 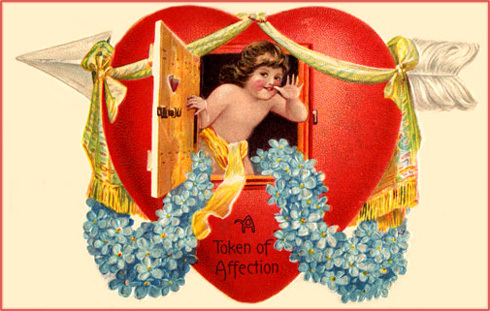 Historians have really been pulling out their hair in sheer frustration as the link is still quite foggy: What has St. Valentine got to do with the celebration of love? Apparently during the reign of Emperor Claudius young men were prohibited from marriage. It seems that Emperor Claudius thought that women and children too big a distraction for the potential soldier. However, Priest Valentine obviously thought this to be a silly law and decided to matters into his own hands. Unfortunately his role as secret 'love binder' was discovered and he was sentenced to death for disobedience of the Emperor. While being in prison Valentine rumor has it that Valentine fell in love. And the person at the receiving end was possibly the jailor's very own daughter who he supposedly had healed. 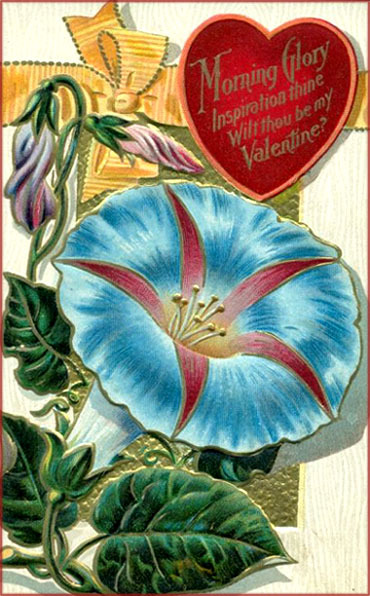 Before being executed, Valentine was to have written her a combined farewell love letter signed with the now all famous expression often seen on Valentines Day Cards, "From your Valentine"
Besides the hazy St. Valentine legends, there is one more possibility that might explain the relationship between love and Valentine's Day. Geoffrey Chaucer (a famous English poet of the Middle Ages) is probably the first person to set love and Valentine's Day in the same sentence or verse. "For this was Saint Valentine's Day, when every bird cometh there to choose his mate"
Now most people though that he was referring to February 14th (Valentine's Day) but it is most likely that he referred to May 2, as this was not only the wedding day for King Richard II of England and Anne of Bohemia but also the saints' day for Valentine of Genoa. Besides, February 14th is thought to be a little bit too early, even for desperately lovesick birds to begin mating in the cold winter struck Britain. While we thoroughly wish you to enjoy this collection, we do require that you only use them for private purposes only. Thank you! Clean photo of the beach with the sand all smooth and heart drawn in it. The blue sea can be spotted in the background. Cute couple of children sitting on a fence surrounded by flowers and a big bee flying against a blue sky. 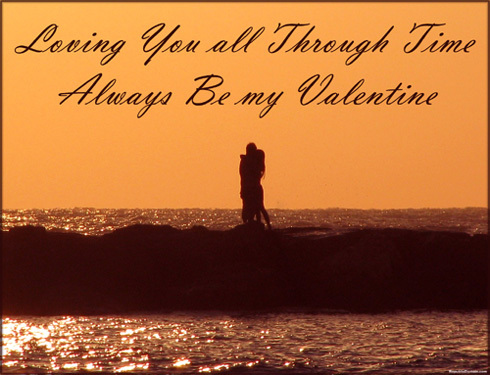 Different Valentine Greeting Card With Great Valentines Poems. 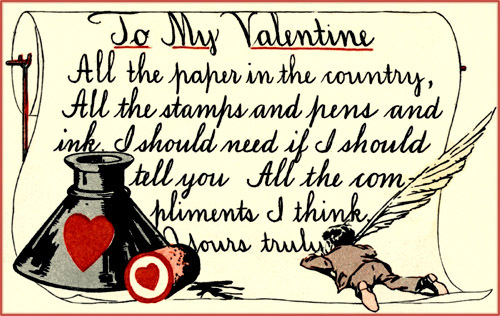 Drawing of a little man, his feather pen, a big bottle of ink and a huge Valentine letter. 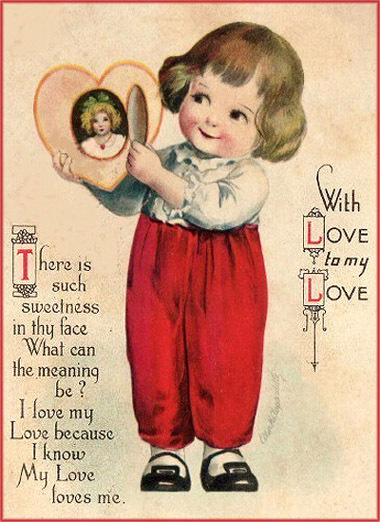 Beautiful old Vintage card with a small angel looking out through a window in a red heart that is pierced by a big arrow. Decorative photo of a silhouette of a young couple hugging at the beach during a romantic orange sunset. Old drawing of two children and four little angels. 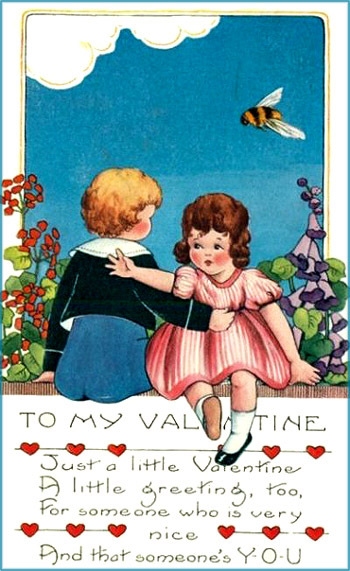 The girl is sitting inside the house reading a book waiting for the boy to arrive with his red Valentine gift. The boy is being pushed by the little cherubs as if being late. 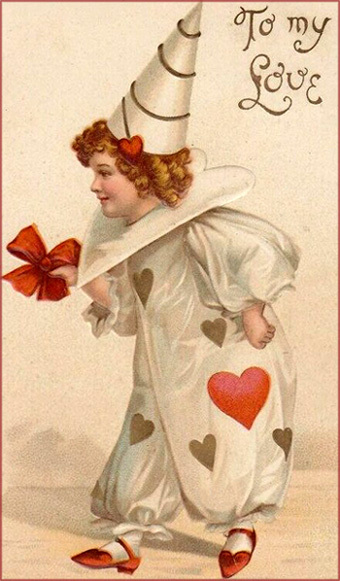 Cute Valentine picture of little boy in a clown like costume with hearts on. Lots of outlines of hearts on a purple background. Picture of cute little boy in white shirt and red pants holding a heart locket with a portrait of a young woman. What can the meaning be? Cute painting of two children sitting on a bench. 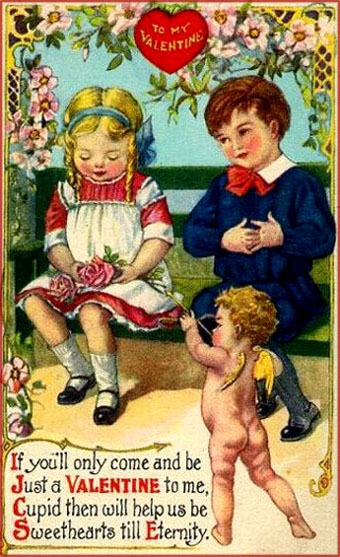 The little girl with braids and long blond hair has received two pink roses from the boy sitting by her side. 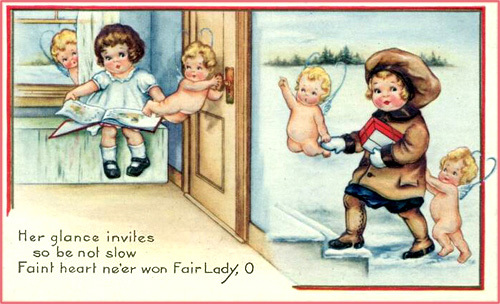 A small cupid is helping firing up the romantic ambience with his arrow pointing at the girl. 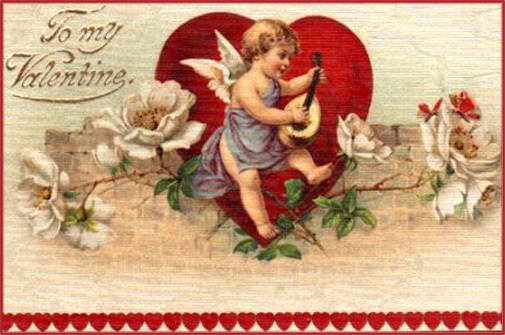 Very old card with a little cupid playing a small guitar / ukulele kind of instrument. Also big white roses and a red heart. 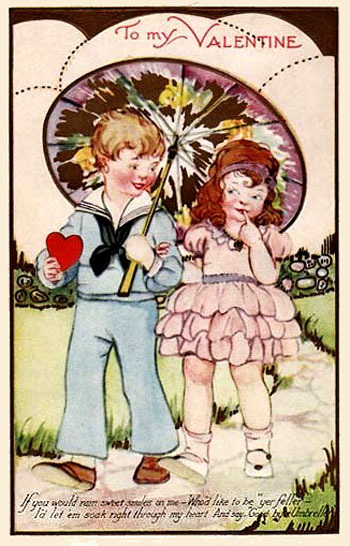 Old drawing of boy wearing a cape and hat adorned with lots of red hearts and holding a Valentine letter in his hand. Valentine picture of a white piece of paper, a red marker and a simple love heart drawing. Old vintage drawing of a big red heart pierced by Cupid's arrow. At the top flies two white doves, one carrying a Valentine letter, the other carrying another arrow. At the bottom is a rose twig with a few pink wild roses. 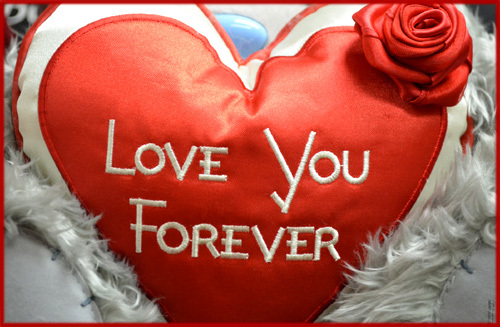 Cute photo of big Valentine heart pillow with a red rose in the corner. 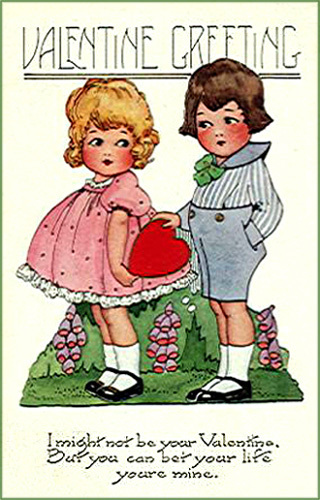 Sweet drawing of little girl in pink dress and little boy in blue handing her a red heart. 'I might not be your Valentine. 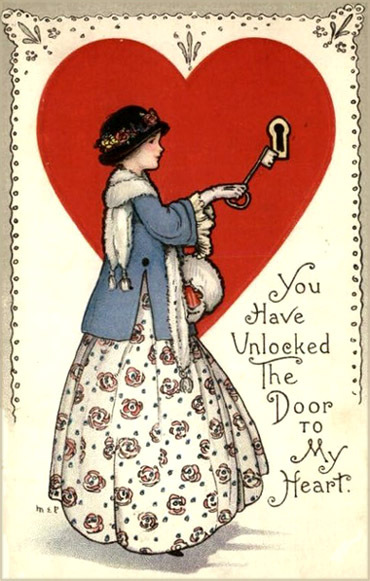 Simple Valentine drawing of woman holding a big key trying insert it into the keyhole of a big red heart. 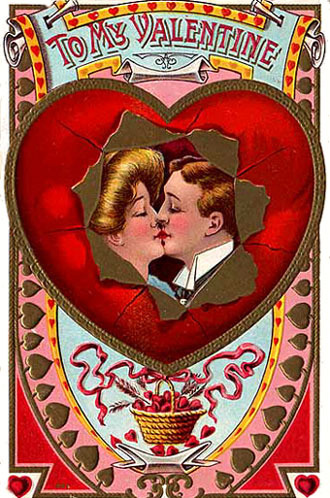 Colorful drawing of man and woman kissing inside red heart. 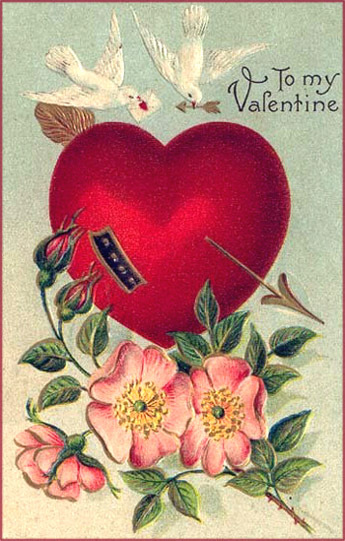 At the bottom is a woven basked filled with red hearts and several of Cupid's arrows. Sharp and pretty photo of two red tulips next to each other. 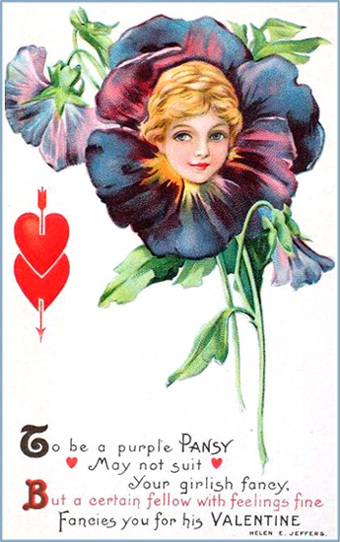 Drawing of big purple pansy with a portrait of a pretty blond young lady smiling. Also two red hearts held together by an arrow. May not suit your girlish fancy. Beautiful drawing of young woman in profile. 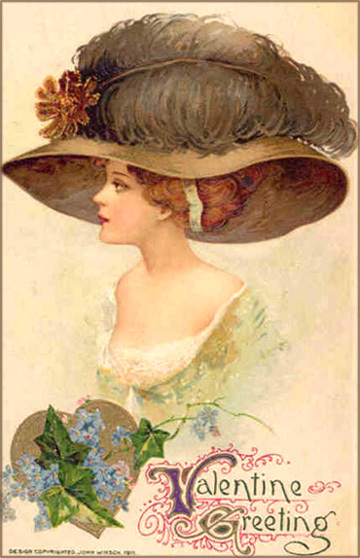 She is wearing a big hat with what is probably an ostrich feather.